Background: Acute myeloid leukemia (AML) and myelodysplastic syndromes (MDS) are heterogeneous groups of disorders with a spectrum of clinical presentations and outcomes. Prognosis depends on various factors including age, karyotype, performance status, previous treatments, and mutation status. 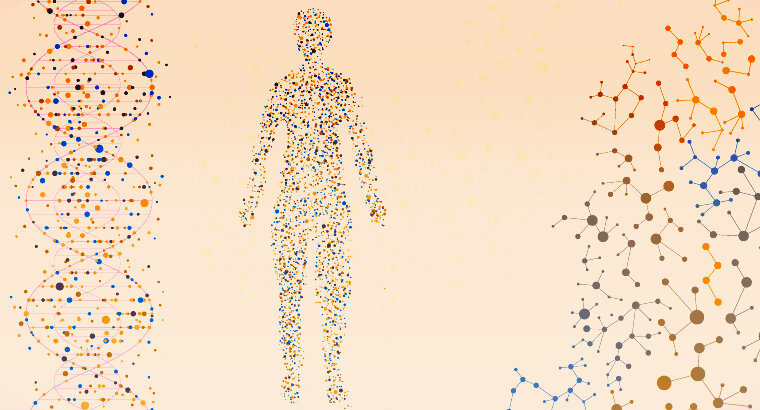 Genetic profiling with next generation sequencing (NGS) is increasingly being used at diagnosis to detect presence of somatic mutations for prognostic risk stratification, and identification of therapeutic targets. Here we seek to identify epidemiologic differences in genetic mutations based on population and demographic data in patients with a preliminary diagnosis of AML or MDS. Methods: NGS mutation data were collected for 62 genes related to AML/MDS on a total of 10,934 patient samples submitted for testing for suspected AML/MDS. Samples were run on either the 54-gene NeoType Myeloid Disorders Profile (Neogenomics) or the 37-gene OnkoSight Myeloid Malignancies Panel (Genpath). 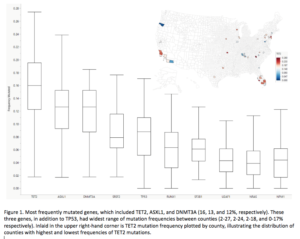 The frequency of gene mutations (i.e., the number of patient samples with mutations for each gene) was identified for 58 counties in the USA. 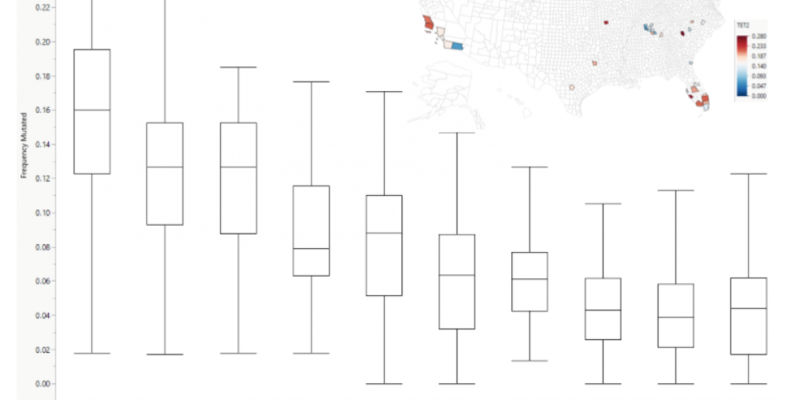 Counties in which fewer than 50 patient samples were tested were excluded from the dataset to minimize sampling bias. The counties were then grouped into 3 categories ranging from most urban to most rural based on a modified version of the 2013 National Center for Health Statistics classification system G-1 – > 1,000,000 (N=34), G2 - 250,000 – 1,000,000 (N=16) and G3 < 250,000 (N=8). One-way ANOVA and subsequent T-tests were performed for all genes based on the 3 urban-rural groupings to determine if significant differences in frequency of mutations exist between the 3 groupings. Difference of proportions tests were performed to identify variations in the patterns of frequency between counties. Results: The top 10 most frequent mutations were TET2, ASXL1, DNMT3A, SRSF2, TP53, RUNX1, SF3B1, U2AF1, NRAS, and NPM1(highest to lowest). 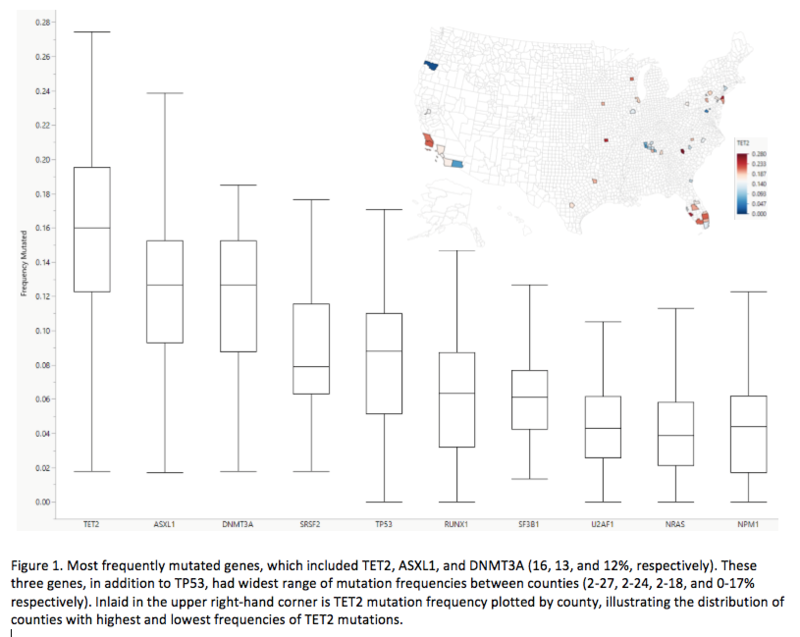 The three mutations with the widest range of variability across counties were DNMT3A, TET2, and ASXL1 (DTA mutations). The median age across all counties was 68 (range 44-77). The county with the youngest and highest median age was Montgomery, CA and Pinellas, FL, with ASXL1 and TET2 as the most frequent mutation, respectively. Sacramento, CA had an unusually high rate of ASXL1 mutations (> 24%). ASXL1 was also significantly higher than TET2 in Essex, NJ; Montgomery, MD; and Sacramento, CA. (p=0.0287, p < 0.0001, p < 0.0001, respectively). IDH1was higher than IDH2 for Martin, FL (p= 0.0481). The highest frequency of TP53 mutation (24%) was in Bexar, TX compared to Montgomery, MD which had the lowest (2%). When counties were grouped based on population density, the frequency of RUNX1 and SF3B1 were statistically different across the counties, highest in G2 compared to G1 and G3 (p= 0.0294 and 0.0010 respectively). Conclusion: Our retrospective observational study is the first of its kind to look at genetic mutations in AML/MDS patients across the United States using commercially available NGS platforms. In general, patients had analogous combinations and frequencies of mutations commonly seen in AML and MDS, and the wide variation in frequency of DTA mutations is consistent with information known about age-related clonal hematopoiesis. In counties that showed a higher rate of ASXL1 > TET2, there may be a potential environmental factor accounting for this difference as the reverse is more commonly seen. Likewise, IDH1 mutations are typically seen at a lower frequency compared to IDH2, and it is interesting to note the reverse in Martin, FL (G2) despite the mutation frequency of all other genes being similar compared to the median for all counties. Our data analysis also showed a significant difference in frequency of mutations for TP53, RUNX1, and SF3B1. These variations have important implications in regard to prognosis, and the approach to treatment. Our observations suggest further investigation is warranted to explore potential environmental exposures related to somatic mutational patterns in patients with AML and MDS. Disclosures: McCloskey: Jazz Pharmaceuticals: Consultancy, Speakers Bureau; Celgene Pharmaceuticals: Honoraria, Speakers Bureau; Amgen Pharmaceuticals: Speakers Bureau; Pfizer: Consultancy; Takeda Pharmaceuticals: Consultancy, Speakers Bureau; COTA: Equity Ownership. Koprivnikar: Amgen: Speakers Bureau; Otsuka: Consultancy; Alexion: Consultancy, Speakers Bureau.